Every year, WHITE64 conjures up a company holiday project for which the independent full-service shop itself is its own client. The idea is to create something that is not only fun and builds morale, but also can serve as a communications tool to attract new clients and help the agency tell its own story. The campaign first released a teaser video on December 15 that featured CEO Matt White announcing the week of December 19 as the reveal date for this project. In the spot, he cryptically discusses developing this new transportation method for an unnamed client, who of course, is Santa Claus and his sleigh. 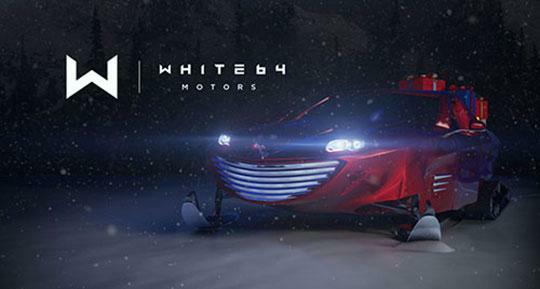 The video and site are designed to have fun, holiday components that play along with the parody, including comments from the chief designer, named “Chris Eve,” and customizations that let users pick their own license plates, hood ornaments, sleigh color and treads. Visitors are invited to “”pre-order” theirs at white64motors.com. The multimedia effort includes email, teaser video, dimensional gift package, website and video that all work together to deliver a renewed belief in Santa. The agency has fun with these multifaceted holiday projects, says Carrie Edwards, president, WHITE64. Until last year. the agency approached its Christmas project tactically – one-off funny, such as an employee as a Xmas tree, paint ball, snowball fight, etc. “But beginning in 2015, we embraced a more strategic approach to create engaging content and showcase how we think creatively, film and build an experience,” she says. Last year, the agency celebrated the creativity of its hometown Washington, D.C., market and highlighted the stories of 12 artists from all aspects of creativity: a chef, a paper sculptor, an architect, a muralist. Each mini documentary – one to two minutes in length–was shot in a different style. They were revealed daily via a Web site and multichannel promotion for 12 days.